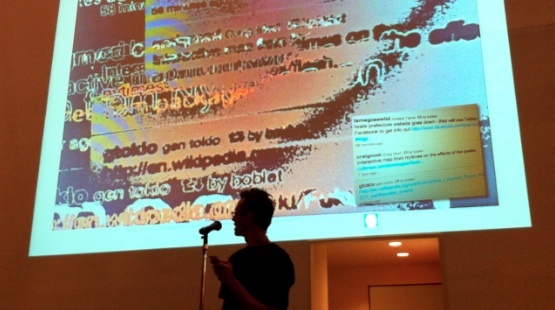 this presentation was given at pecha kucha night nishinomiya vol.8 for the relief fundraiser event. Good evening, tonight I want to share some artwork with you, while you are viewing the work, you are welcome to listen to some of the story that goes along with it…but you don’t have to. As the events unfolded in the minutes, hours, and days following the March 11th earthquake, I was impressed by the natural and organic way that technology and social media tools were appropriated by people in Japan and around the world. Within minutes of the first quake, people were communicating on Twitter and networking in real time. As this played out, I began to document some of the process by taking photos of various web pages on my computer screen. Each of these works began as a photo which you can see in the lower right and evolved through a process of down-sampling using a digital camera, some automatic filtering, color tweaking, and other additions and subtractions. 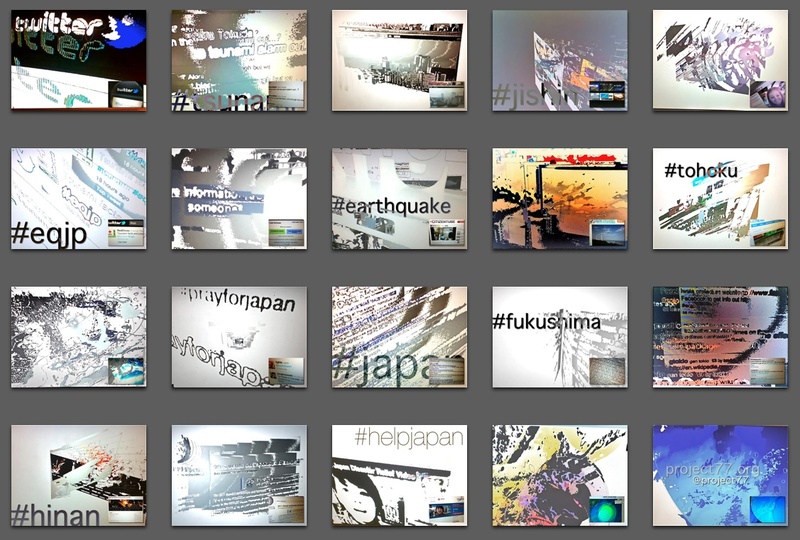 Within an hour of the first tremors, Twitter lit up with more than a hundred tweets per minute coming out of Tokyo and several hashtags were well established including #eqjp, #earthquake, #tsunami, and #jishin. People posted webcam links to spots in Tokyo. Japanese and English news channels were rebroadcast online using Ustream. Using Skype and Gmail call phone, we were able to contact family in North America and alert them that Kansai was fine before they had even heard the news of the quake. That night we kept electronic watch over a friend in Chiba who had to spend the night at a shelter due to the tsunami warning. We tracked other friends and relatives in the Tokyo area as they made the long hike home and endured the constant aftershocks. Within the first 24 hours, Google person-finder and several crisis response pages provided ways for people to look for and report missing persons. Many videos had been posted to Youtube and a special curated area called Citizentube featured videos from across Japan. Facebook pages were created to provide information for foreigners in Japan. As the events unfolded near #Fukishima, links surfaced for a live web-cam of the plant, a live feed of a geiger-counter in Tokyo, and the surf report provided surface wind conditions. An English translation of the initial TEPCO report was posted on a code repository site. During this time, the hashtags #prayforjapan and #helpjapan stayed at the top of the worldwide trend list at thousands of tweets per minute. Web sites emerged with the sole purpose of providing highlights and inspiration to those in and out of Japan, including Cheer Up Japan and Tweets from Japan; featuring English and Japanese translations of some of the messages and tweets dedicated to and coming out of the country. Last night when I was tired out waiting for the train at the station, the homeless people gave me one of their cardboards to prevent the cold… even though we usually ignore them in daily life… So warm. Within the first week, the strained Iwate prefectural website moved its operations to a Facebook page and Facebook itself began to regularly update the rolling blackout schedules on its home page. University students and other individuals formed ad hoc translation teams and blogs were set up to assist foreigners through updates on the Fukushima plant and tutorials in earthquake preparedness in multiple languages. Wikipedia entries reflected the latest status of the situation and several social sites like Reddit and Ustream chat became organic communication centres. During this time several relief and assistance plans emerged as well. iPhone applications for reporting your location and condition in an emergency, code relief, #hack4japan, and several private organizations offered their collective abilities to create maps, mashups, and information or data sites. Many private sites began to provide links for donations to relief and rescue organizations as well as to match donations with their own goods and services. SXSW festival offered a way for individuals and groups to set up their own relief page on the festival site and direct all proceeds to the Red Cross. On the 21 of March 2011, the IAEA Director General, Yukiya Amano, reported to the Agency’s Board of Governors following his trip to Japan to assess the nuclear safety emergency. His main thesis was that technology has changed the way information is dispersed and spread and the international response plan must be reviewed and revised accordingly. As the events of March 11 unfolded, technology played a vital role in facilitating real time communication and timely responses. Social media technology and free access to the internet in the hands of individuals allowed the formation of very organic and very efficient networks of communication and mobilization that were often as accurate, if not more, than the network media channels. The world has indeed changed and will continue to change in profound ways, let us always make use of what we have at hand to connect people and create and maintain community. The complete series of works will be posted on my portfolio site.